Dashi this, dashi that… if you are interested in Japanese cooking, dashi is one of those keywords that pops up in nearly every recipe. In this Japan Centre feature post, I am going to explain exactly what dashi is, how it can be used to enhance your cooking and most importantly, how to make your own dashi! Dashi is a flavouring stock used in Japanese cuisine, giving that quintessential Japanese flavour to your favourite foods. It all starts with something called “umami”, which when translated from Japanese to English, “savoury” is probably the closest word. Umami was discovered as one of the five senses to accompany sweet, sour, bitter and salty and is a more friendly name for the taste of glutamates. Our tongues are quite partial to umami flavours which is why strong, intensly flavoured foods, especially when paired together can give an even more intense flavour. Ever tried cheese and marmite, or parmesan on tomato sauce? Oh yes, those are certainly foods that taste even better when you combine them together! So, this idea of umami was discovered by a Japanese scientist as Japanese food is full of foods filled to the brim of delicious umami flavours. One of the main combinations is the perfect harmony of konbu seaweed and katsuobushi bonito flakes strained together to make dashi, essentially a liquid form of umami! Dashi is used in so many Japanese dishes that it is impossible to name them all. Everything from noodle soups to mixing with egg for an omelette, all of these dishes have dashi in, and that is why they all taste so good! Are Dashi and Tsuyu the Same Thing? Dashi and Tsuyu are similar, but tsuyu also has added soy sauce and mirin. Tsuyu is traditionally used as a ready-made concentrated dashi liquid which is diluted with water and then used in various dishes. As many Japanese recipes require dashi, soy sauce and mirin, you can use tsuyu as an alternative to mixing these three base ingredients. If you use tsuyu instead of dashi in a recipe, it is important to not add any additional mirin or soy sauce as it will become too salty and dark in colour. So, How Do I Make Dashi? There are a variety of different types of dashi; vegetarian, instant… so what is the difference and which one is the right choice for you? Instant dashi is the easiest way to make dashi. The instant variety comes in a powder form that is mixed with water to create a liquid dashi stock. The most common type of dashi is made with katsuobushi bonito flakes and konbu kelp so it is not suitable for vegetarians. Making your own dashi is actually a lot less complicated that it seems. It just requires a few special Japanese ingredients and some water. Once you have made a batch of dashi, you can keep it in the refrigerator and it will last for a few days. If you don’t use it up in a few days, it is easy to freeze in zip-lock plastic bags and you can defrost in the fridge overnight whenever you need it. 1. Start by opening up your pack of konbu kelp and wiping it down with a damp cloth to remove any impurities from the surface. 2. Add a piece of konbu kelp approximately the size of a postcard with the water into a large pot and let it soak for about 20- 30 minutes in the cold water. 3. Turn on the heat and allow the water to boil slowly. 4. Just before the water boils, remove the heat and add your katsuobushi to the pan. 5. Without letting the water fully boil over, allow the katsuobushi to simmer in the water for 1 minute. 6. Remove the konbu and katsuobushi from the pan and strain through a fine sieve into a clean jug or pot. That’s all there is too it. Unlike making soup stock in other cuisines, Japanese dashi stock is very quick and easy to make. 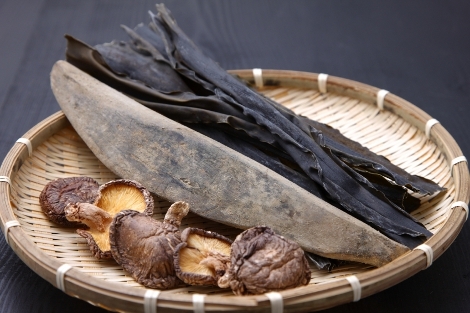 To make vegetarian version of this classic Japanese dashi stock, simply substitute the katsuobushi bonito flakes for dried shiitake mushrooms and allow the flavour of the konbu kelp and shiitake mushrooms to infuse with the water. Allow the ingredients to soak in cold water for a few hours before heating and straining like the katsuobushi recipe. You can then use the shiitake for any number of Japanese dishes afterwards too. What Can I do with My Dashi? – Miso Soup: Just add a little of your dashi stock to some miso paste for an instant, healthy and delicious soup. – Noodle Soup: For a truly authentic Japanese noodle soup, add a few drops of soy sauce and cooked noodles. – Tempura Dipping Sauce: Mix in a little mirin and soy sauce and you have created a perfect dipping sauce for light and crispy tempura. There are lots of different ways to use dashi. Simply add a little when you are cooking and get that authentic Japanese taste in all of your dishes. Make sure to check Japan Centre for all the other ingredients to accompany your new dashi stock as well as our authentic Japanese recipes! Posted in Food and tagged Dashi, Tsuyu. Bookmark the permalink. Get FREE Postage When You Spend Over £20 Until Sunday!